Since January, I’ve been reading the same book, page by page, with the aim of finishing it up at the end of January. That’s right. One page a day, for the entire year. 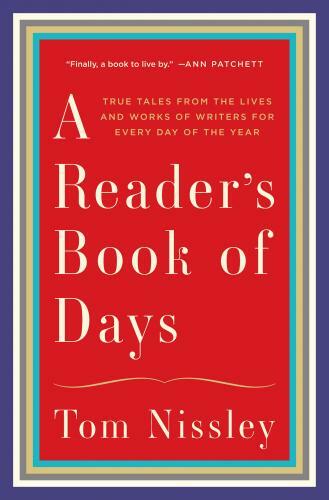 It’s so unlike me — the one who cranks through reading and writing — but The Reader’s Book of Days by Tom Nissley is designed this way, as each page is a calendar day filled with news and information about the literary world that has taken place on that single day. I love how each page is like a message in a bottle, and I can’t help but imagine the painstaking research that went into this book by Nissley. There’s very little in terms of boring events, and his own writing style in crafting the vignettes on the page (typically, about five or six small stories) is engaging, light-hearted and enlightening on a variety of levels. How A Reader’s Book of Days Was Made from WW Norton on Vimeo. I’m sharing this book out because reading it is like a cousin to Slice of Life, where small portraits of writers and books and characters and intrigue from the literary world inhabit each day. It’s a wonderful book, and one that I use as a sort of nightly appetizer before digging into a novel or non-fiction book that is the main read. A Reader’s Book of Days settles me in, bringing me into the spirit of the book. The author of this book was on Jeopardy last night! The money he won when he was on originally allowed him to quit his job and write this book. Thanks for sharing your thoughts about it. I’m off to order a copy! I knew he is a former Jeopardy champ but I didn’t know he was still doing it. Cousins, reading and writing. Like that thought. I haven’t seen this book yet. I must check it out. Thanks. What a find. I like the idea of an appetizer to the main meal too. Thanks for sharing your methodical ways. Have to get this book! On my list to get during spring break! I think I already shared this somewhere — maybe as part of comment over on Ft Rhizo the FB outpost unexplained add on to the books thread — or somewhere else I can’t remember. The video is so engaging I’ll probably do it again. PS So since I remembered (almost too late) yesterday to start slicing, I guess this and above count as ab #sol14 comment. I try to do something for April/poetry too — not writing poems but trying to more read by myself and others.